Are you celebrating Father’s Day today? 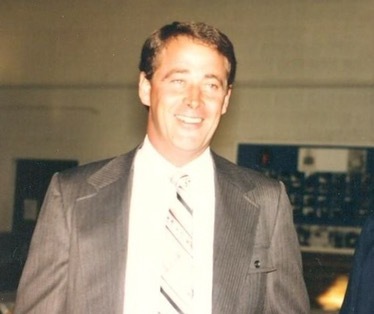 Although my dad is a five hour drive away, I am thinking of him today. You may remember a post I wrote for my mom in May, when I listed 70 things I love about her for her birthday. I thought it’d be fun to do something similar for dad. 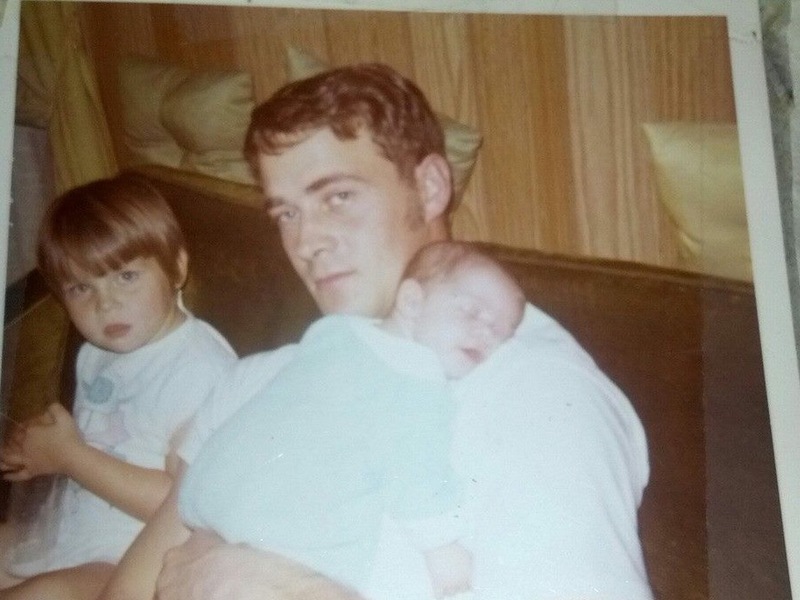 This is his 49th Father’s Day, so here is my list of 49 things. How you love your family. How you wear your heart on your sleeve. All the years you worked in the packing house, even though it was rough work. That you and mom dated in high school. How you took care of grandpa and grandma every Wednesday for 3 years. How you can make anything out of oak. That you grow your own grapes and make grape juice. That on the hottest of days, you won’t let weeds take over the garden. That you used to be a volunteer EMT and fireman. How you and mom have been married 49 years. That you always take us golfing even though our meandering slows down the game. 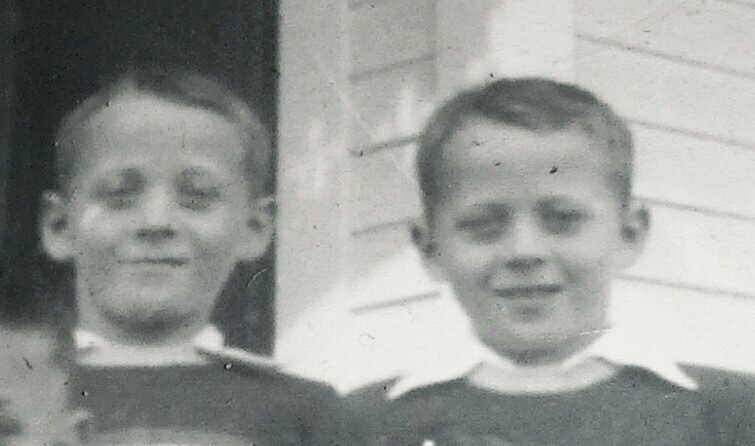 The stories about you and your identical twin when you were in school. That you still take us on vacation with you. That you had 4 kids by the time you were 28! That Santa Claus always showed up even when we were told there wouldn’t be much. How you and mom showed up cheering at every ball game and track meet. How you buy me books that catch your eye. How you cried when I told you the wish list of a family we sponsored one Christmas. Later you slipped me a $20 and told me to get them a game. How you drove 45 miles one way to work for over 20 years. How you still get excited about opening Christmas presents. Your unending support during our pregnancy difficulties. How you made cradles for the grandkids when they were born. Hearing the stories about when you were young. That when you were in Iowa and found out I was in the hospital, you left at 6 am, picked up mom and drove 5 hours to see me. That on the holidays you get out the roasters and make turkeys and ducks. That when we visit, you’re the first one up, and you start making a huge breakfast for everybody. How you picked cherries when you were a kid to help grandma make cherry pies. That you helped grandpa on the farm. 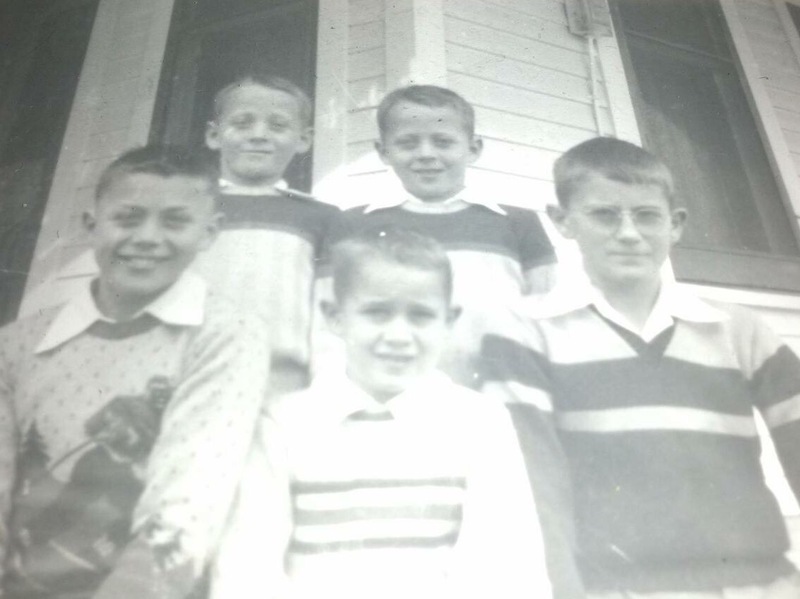 That your parents lived in the same farmhouse for 60+ years and it was the house you helped build. That we get to traipse around in the same barn you did as a kid. That we get to hike and sled on the hills you ran up and down growing up. How you eloquently handled your twin brother’s passing 9 years ago, when I thought it would crush you. How you make time for us kids and your grandkids, even though you usually have to do the driving to get to us. That you won’t eat store bought tomatoes. How you still vote and have political opinions. That when a relative on mom’s side passed away, you went to the funeral by yourself because mom was sick and couldn’t go. How you bought a Vita Mixer before it was the cool thing to do. That you love each of us as we are. That you gave me a fancy pocket watch for my wedding gift. That you walked me down an aisle, that was really a picnic area on the side of a mountain. That you probably don’t know that there’s only one regret I have in my life, and it’s that I didn’t dance with you at my wedding. When the day was over, my baby sis whispered in my ear, “You didn’t dance with your dad”, and that’s haunted me ever since. That you’ve spent almost all your life, living for your family. How every time I come home, you get up from your chair and are waiting at the door with arms outstretched. Because of that, I think part of me will always stay a little girl with pony tail and chubby cheeks. Hope you have a great Father’s Day! I love you, Dad. So sweet. Dads are the best!! Hi!! :) Thank you! Yes, I agree! I feel extra blessed today because a lot of my friends have lost their dads and Father’s Day is tough for them! Hope you’re having a wonderful day. It’s SO hot!! That makes me wish I really was your brother. Thank you so much! I thought the same thing about your pictures of your dad! I love that black and white one of you guys in swim suits! Of course, Jess. Hope you had a nice weekend! Fun times! Maybe your grandson like it, too? Not yet… We saw one outside and I pointed it out. He went to look at it and it flew right at him and he freaked! The list is brilliant. Judging by that list your dad really is an amazing guy. Hey sweet friend, thank you! I thought 49 things would be hard, but it wasn’t at all. Yes, he’s pretty amazing. Thank you for your comment about the pictures. 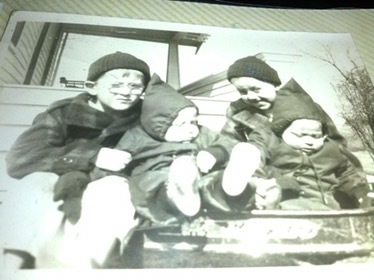 Dad and his identical twin are the babies in the pointy hoods in the black and white picture. 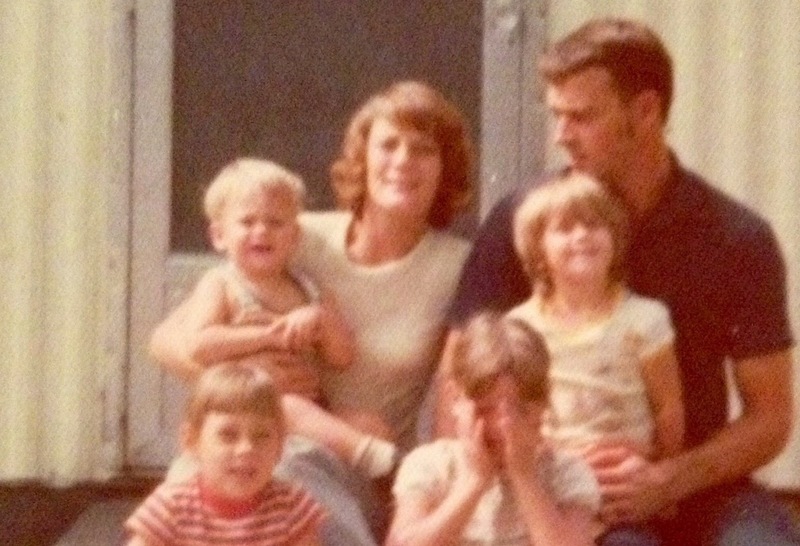 Can you guess which one I am in the one with mom and us kids? OK, I’ll do it now! Are you the one in the red/white striped top? Or the one right next to her? Too bad I can’t see much of the face because I’d actually like to say you’re the hands-in-face kid. And did you notice that your mum looks like Susan Sarandon in this photo? Oh, I’m so glad Sylvia! I can just imagine your father’s happy face reading this – chuffed to bits! Absolutely lovely, Jessica. Hey sweet girl, I bet you’re right. And, thank you. How are you doing?